Don’t just charge them… SuperCharge them! This is one of our very best feature and ideal kits for anyone with a new iPhone 5, iPad 4, iPad mini, iPod touch 5, or iPod nano 7. 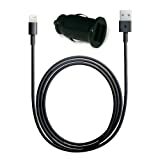 It includes a great charger adapter for your car and two (2) new Lightning to USB 2.0 charging data sync cables. Stand has three slots for your ipad third generation so to obtain perfect eye level with device. All rights reserved. All trade names are registered trademarks of respective manufacturers listed. Apple®, iPhone ®, iPad®, iPod ® are registered trademarks of Apple®, Inc. Apple® does not endorse use of these products. 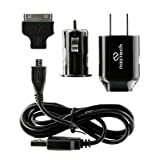 The Naztech N120 Universal AC/DC USB Charging Kit is small and lightweight for convenience, portability and easy storage. Experience the convenience of an AC charger for Home and Office, and a DC charger for mobile and travel use. 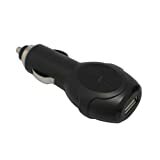 Charge your iPad, iPhone, smartphone, iPod or MP3 player using any USB charging cable or the included micro USB cable and Apple 30 pin connector. Now you’ll have the best of both worlds wherever you are. Don’t just charge them… SuperCharge them! This is one of our very best feature and ideal kits for anyone with a new iPhone 5, iPad 4, iPad mini, iPod touch 5, or iPod nano 7. 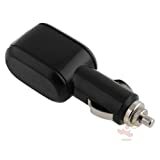 It includes a great charger adapter for your car and a new Lightning to USB 2.0 charging data sync cable. Simpy carry an extra handy and light travel charger and you can charge up anytime, anywhere! Intelligent IC chip inside recognizes a fully charged battery and automatically switches to a saver mode to prevent overcharging and short circuit. © 2012 Welcome to What's an iPad.